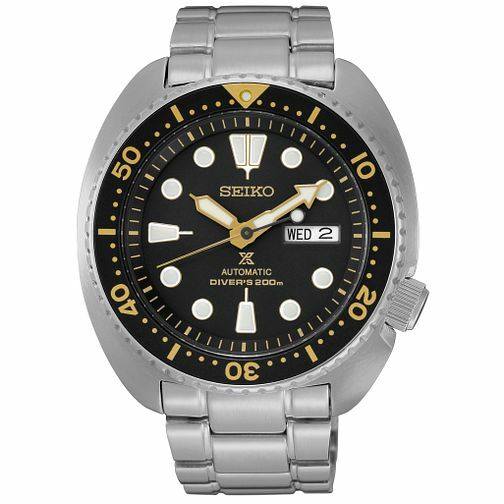 Offering fashion sports style, this stainless steel bracelet watch from Seiko makes for a great everyday timepiece. Powered by automatic and water resistant to 200 metres, this model prides itself as a certified divers watch. Finished with a bold two tone case and black dial complete with luminescent markers, this watch is ideal for an active lifestyle. Seiko Prospex Men's Stainless Steel Bracelet Watch is rated 5.0 out of 5 by 2. Rated 5 out of 5 by Anonymous from Excellent. Great looking cult watch at a bargain price in the sale. Speedy delivery, no complaints!